#153 - Little Bo Peep (#2) - SOLD - Bisque, frozen legs, labeled box with cardboard restraint. Beautiful doll with stunning purple flowers on her hat. #154 - Curly Locks (#1) - $45 - Bisque, slim tummy, jointed legs. Dress is somewhat dusty and hat ribbons are partially frayed. She'd love someone to freshen her up! #154 - Curly Locks (#2) - $55 - Bisque, frozen legs, labeled box (water stain on bottom of box going up on the sides.) Doll is in excelllent condition. #155 - Cinderella (#1) - $185 - Bisque, jointed legs, pudgy tummy, MOLDED SOCKS, MOLDED BANGS, SILVER SLIPPERS. Separate lace-trimmed slip and pantaloons. Beautiful embroidered panel on the front of the dress although the rest of the overskirt is very fragile with tears. Still displays very nicely. #155 - Cinderella (#2) - SOLD - Bisque, frozen legs, wrist tag. Dress is somewhat rumpled. #156 - Beauty (#1) - $115 - Bisque, jointed legs, slim tummy. Very faint age spots on dress, though dress is crispy with nice coloring. #156 - Beauty (#2) - $185 - Bisque, jointed legs, pudgy tummy. Hair is slightly fuzzy but beautiful doll. #156 - Beauty (#3) - SOLD - Bisque, frozen legs, labeled box. Dress has faint stain on top front of skirt. She is missing her feather in her hair, but nice full wig and doll is very sweet. Inside the box is what appears to be the original 1940s birthday wrapping paper. Cute! #157 - Queen of Hearts - $135 - Bisque, jointed legs, pudgy tummy, wrist tag (band is torn), labeled box (some split corners on lid) with red heart insert and cardboard restraint. Her wig has relaxed somewhat, but a lovely doll. #158 - Sugar & Spice - SOLD - Bisque, frozen legs, labeled box with cardboard restraint. Comes with a piece of paper indicating she was received as a birthday gift on 8/25/43. (Fun to know those details!) Sweet doll! #159 - Ring around a Rosy (#1) - $85 - Bisque, jointed legs, slim tummy. #159 - Ring around a Rosy (#2) - $65 - Bisque, frozen legs, labeled box with cardboard restraint. Excellent condition, appearing to have never been played with. #160 - Pretty Maid (#1) - SOLD - Bisque, jointed legs, pudgy tummy, MOLDED SOCKS, labeled box with cardboard restraint. Air Mail sticker on top of box. Dress is somewhat faded (though evenly.) Note the cute pink Scottie dog pin that some little mommie added long ago. Very sweet! #161 - Jennie Set the Table (#1) - SOLD - Bisque, frozen legs. Dress is slightly faded. #161 - Jennie Set the Table (#2) - $115 - Bisque, jointed legs, slim tummy, heavy wrist tag, labeled box, brochure. Also includes cute vintage Christmas tag. Very sweet! #161 - Jennie Set the Table (#3) - SOLD - Bisque, frozen legs, heavy wrist tag, labeled box, brochure, and cardboard restraint. 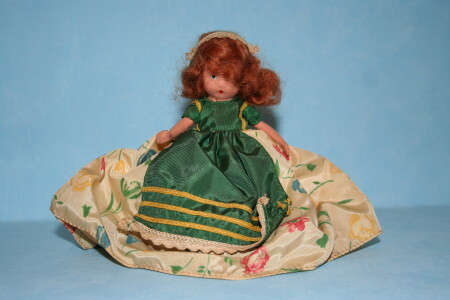 Doll is in excellent condition with unfaded, brightly colored clothing. #161 - Polly Put the Kettle On - SOLD - Bisque, pudgy tummy, jointed legs, separate slip. Very nice condition though she is missing her teapot so priced much more reasonably. 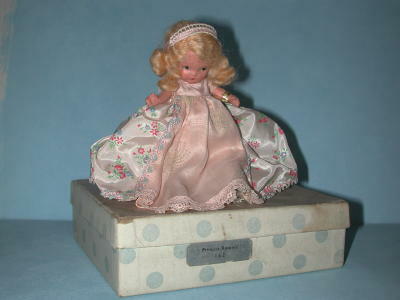 #162 - Princess Rosanie (#1) - $145 - Bisque, jointed legs, pudgy tummy, wrist tag, labeled box. There are several small tears in the sheer panel overlay, but these are only noticeable upon close inspection. Displays very nicely. 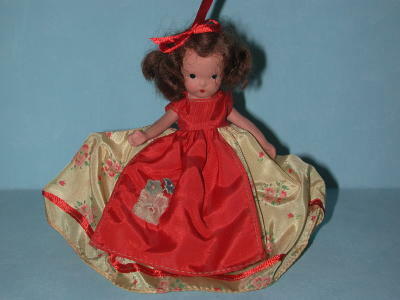 #162 - Princess Rosanie (#2) - $145 - Bisque, jointed legs, pudgy tummy, heavy wrist tag. A couple faint age spots on dress, only noticeable on close inspection. Beautiful face! #163 - Little Miss Donnet (#1) - $65 - Bisque, jointed legs, slim tummy, labeled box (minor dent). Hat is in nice condition but dress is somewhat faded and rumpled. #163 - Little Miss Donnet (#2) - SOLD - Bisque, frozen legs, labeled box with cardboard restraint. 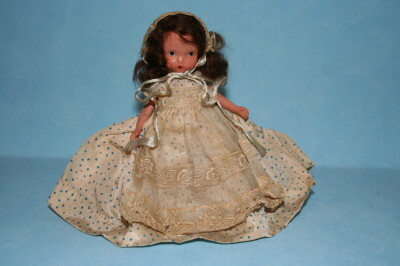 Excellent condition with wonderful bright flowers on her "big bonnet." #175 - Maiden Gay (#1) - SOLD - Bisque, frozen legs, wrist tag (torn band), brochure, labeled box. Excellent condition.